The Best Workout Program of 2013 Already? … and I think you will, too. In fact, it’s the big project I’ve been flying out to Lapeer, Michigan for to film hours and hours of metabolic conditioning workouts, metabolic finishers and even some bootcamp-style workouts. And you can even seen me doing it. More on that in a bit. But first, let’s take a look at the #1 most INTERESTING story of 2012. It was “Sitting Too Much Kills You”. According to a study from the British Medical Journal, sitting too much shortens your life span. If you were able to sit 2 hours less per day, you could live 2 years longer, researchers said. But…you’re too busy. You can’t make it to the gym because of your long, boring commute. Your slammed schedule is keeping you back from making those 2013 goals. “Here I go again”, right? I know what that’s like because I’ve been there. Well, those excuses can now all be overcome. 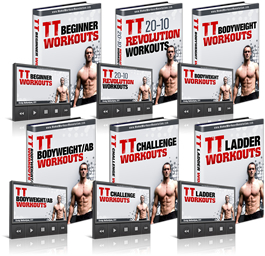 The future of fitness and what I believe to be the Workout Program of the Year, the Home Workout Revolution System, gives you follow-along bodyweight workouts requiring ZERO equipment. You get to do every single movement in real time with Certified Turbulence Trainers Craig Ballantyne, Brian Kalakay and of course, yours truly. Plus, the workouts are short – often under 15 minutes and some as even as short as “Four Minute Miracles”. Why so short? Because last year, research from the journal “Applied Physiology Nutrition and Metabolism” found that an intense 4-minute workout (like the ones in my videos) was just as effective for fitness as going for a 30-minute run. That’s 26 minutes PER DAY you save. I’m sure you could use an extra 78 minutes a week, right? We all can. You don’t need any equipment or a lot of space. Plus, you’ll get instant access to watch the videos online. So yes, you can watch me suffer and drop fat at the same time. And for the next few hours, you’ll receive an extra discount that I’ve arranged with Craig Ballantyne since I was part of the madness in the videos. But hurry, this exclusive offer expires soon.